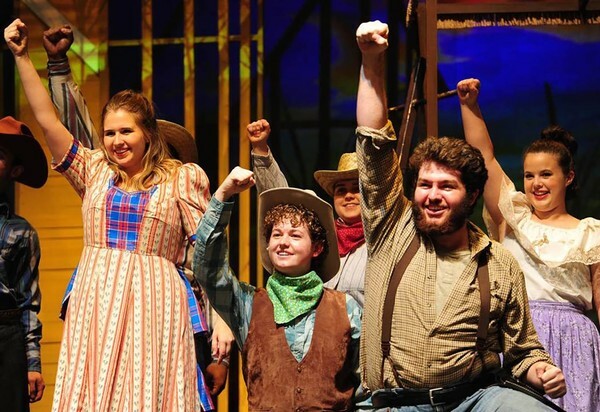 NACOGDOCHES, Texas - The Stephen F. Austin State University School of Theatre, School of Music and SFA Dance Program will present Rodgers and Hammerstein's musical "Oklahoma!" at 7:30 p.m. nightly through Nov. 10 in W.M. Turner Auditorium on the SFA campus. Among the show's performers are, front from left, theatre majors Sadie Mae Taylor, Arlington sophomore; Bayley Owen, Royse City sophomore; Richard Rogers, Kerrville junior; back from left, dance majors Christina White, Rockwall senior; and Sarah Boon, Ennis junior. Single tickets are $15 for adults, $10 for seniors and $7.50 for youth. Tickets for SFA students are $5. For tickets or more information, call the SFA Fine Arts Box Office at (936) 468-6407 or visit www.theatre.sfasu.edu.